This is a simple project aimed to reach a very small bootable windows environment. To achieve the minimum sizes all graphical support was removed leaving only cmd.exe as the default shell. Access to CD/DVD drives and NTFS disks is still supported. PicoXP is one of the very few projects which support the WinBuilder 'Certificate' functionality. That helps the user to proof whether the used scripts are 'from author'. This project has been "composed" from old backups. The original is lost at a server crash some years ago. I fixed some things to let run PicoXP under the latest released WinBuilder version. Due to a script bug %regtype% is not defined. The old WinBuilder versions used as default value for an undefined variable "0"
Nobody got knowledge about the wrong written reg key, and maybe, several weeks later it causes an unexplainable issue in a PE. If there are still bugs I did not detect in my tests, please let me know here. BTW: With this "Reincarnation" of PicoXP, the old topic is closed. Let's start with this new one! Very good, thank you for keeping us posted on what changed and for updating this project. Every time I try to download this, it gets about a third of the way through the download, then fails. And both result in 403 Forbidden. Any idea what the right URI is, or do I have to use Wireshark to find out? That didn't help. Why is a "directory" URI used for getting a file? In my system click on both URLs inside FireFox brings a successful download. IMO the 'directory' URL activates an index.php or similar. Does this version support booting from pxe/tftp? Edited by nthactt, 04 September 2011 - 07:59 AM. Hello everybody and thank you for restoring this wonderful project. I recall some years ago, there was a topic about getting a batch-file to be able to autorun. anything. Thanks and keep up the good work! 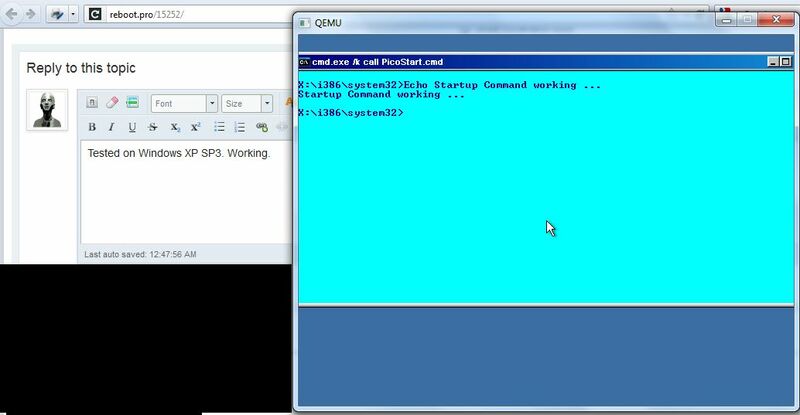 To use the known autorun mechanism in PicoXP is not a "quick and dirty run task". The cmd shell itself has to start a batch. There are some steps to do to create the batch from API autorun entries. I do not split my force into several tasks running at the same time (except emergencies). Currently I'm busy with multiPE NVDA reanimating. This will be finished (hopefully) today. Next step is to bring Amalux's LiveXP to run under WinBuilder 082. Then I'm ready to have a look at PicoXP autostart. When there is no post here within two weeks, please bump. It contains the ability to add a user defined batch to the start of the cmd shell. Peter, one word: You are awesome! This works like a charm, and easy to configure too. I know PicoXP never was intended to run certain files. So this is just a question, what Do I need to add to run commands in my script like format.com, winnt32.exe and so on? With the currently enviroment, these commands don't run, but other commands does . Please understand how the above come from my notes about a different project, so that is possible that I have some more needed .dll's in my "base" that are missing in PicoXP. There exist two stone-aged scripts "addDOSutils.script" and "dos16bit.Script". You can find them maybe in LiveXP, but surelly in Amalux's LiveXP derivate. Next upload I'll them add to PicoXP. IMO they logically belong to the "DOS" - project. EDIT: Sorry, there are macros of latest "common_api" in the scripts. I'll adapt to native WinBuilder language, and then upload. To add the "DOS" commands, is not so easy. Some, like "attrib", work well. Others, like "format", need some GUI support. I'm working on this. On my source (XP SP3 German) it is working well. What's your source? Maybe I have to replace some CopyFile by CopyOrExpand. A more general one (already presented to you but at the time ignored) would be to pre-process the source to make sure that files are available (in the case of PicoXP the processing time is so small that it won't make a difference, but on a bigger project an user might have a few minutes of green progress bars before getting a Halt). Tested on Windows XP SP3. Working. Hold it for a while. At first it seems like you cant leave the emulator but it will. Will these new added abilities allow to use other programs to run as a shell. I'm simply amazed of all your work, Peter and also the rest of you guys. Thank you a million times for these updates to PicoXP. I'm thrilled to test this later today, I will report back to you as soon as I know! Thank you again!